Need a New Pool Liner? Is it time for a pool liner replacement? Is your vinyl pool liner torn or shrinking, is it pulling away from the corners, has it faded with age? Yes, we install and replace pool liners. A lot of companies don't really like doing this type of work, but we love it and we would love to help you bring your pool back to life with vibrantly colored vinyl pool liners available in a variety of pattern designs which will bring you years of pleasure and add to the value of your pool as well as your home. ​After years of the hot summer sun and heat as well as the winter cold, you go to open your swimming pool for the summer and find your liner has just reached the end of it's useful lifespan. Or you have known for the last few years that the time for replacing your in-ground pool's vinyl liner was fast approaching and now IS the time. Your vinyl pool liner isn't getting any younger and isn't going to repair itself. Better to repair or replace it on your time table rather than to wait until your pool is unusable and you have to have it repaired or replaced on someone else's schedule and perhaps at inflated prices because you have waited for the height of the season to make your decision which you knew was inevitable. The truth is that the average in-ground pool liner only lasts 5-12 years. We've come across some cases in which vinyl in-ground pool liners have lasted less than 7 years and other cases where they've had a lifespan of almost 20 years. Many pool builders and liner installers will argue that if the liner is properly installed they will guarantee that it will last 25-30 years, don't hold your breath... Many other factors such as water chemistry, as well the chemicals used and if they are used appropriately, the weather elements of the area in which you live (both summer and winter),as well as luck will also be a major factor. And as for those 25-30 year warranties, well if you read the fine print you'll find that pool liner warranties are very prorated. Meaning that they tend to lose value with every passing year. In most cases a 25 year pool liner warranty will really only have a 2-5 year full warranty, and then they become prorated. Additionally, pool liner warranties don't cover the cost of refilling your pool with water and then the required chemicals and they also don't cover the cost of labor. So, while warranties do matter in most cases you can replace your liner cheaper with us than with your original installer honoring his warranties. Pool liners are custom made sheets constructed of vinyl that fit between the walls and bottom of your pool and the water, unlike shotcrete or gunite pools which use plaster to retain the pools water. ​Typically vinyl pool liners lock at the top edge in a track at the bottom of the coping which is right underneath deck level. This is called the bead. Under the liner is a cement like floor or sand, which is specific to the "cut" of the pool liner will be used. The floors rise up to where they connect to the walls, these are commonly panels of 3 by 8 ft constructed of thermoplastic or galvanized steel. The walls must be supported from the back so they can withstand the weight of the water against them. Generally, vinyl pool liner sales are regional. Some areas of the country seem only to have swimming pools utilizing vinyl liners, but other areas you may not even find one. 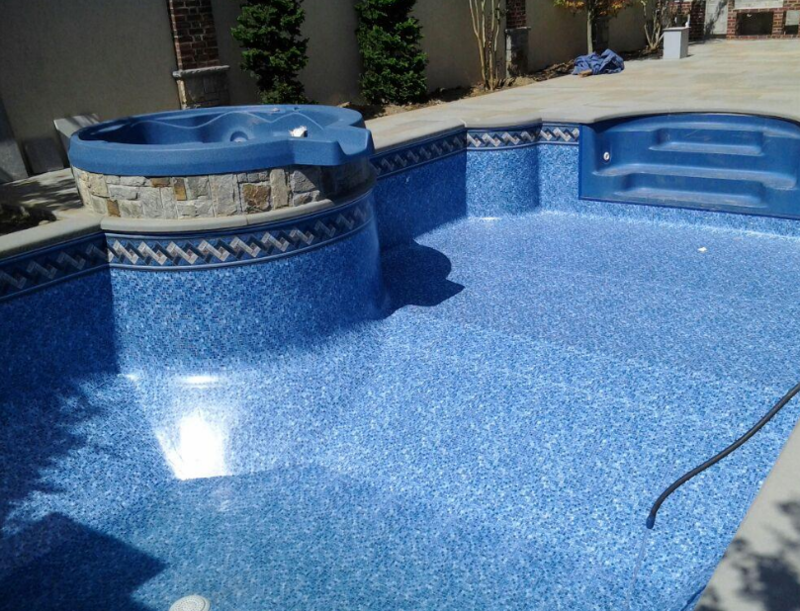 In the Tidewater area a majority of the pools incorporate a vinyl pool liner yet you can still find other types of pools such as gunite or prefab pools in use. In general a pool utilizing a vinyl pool liner can be constructed much cheaper than a concrete (gunite) pool. 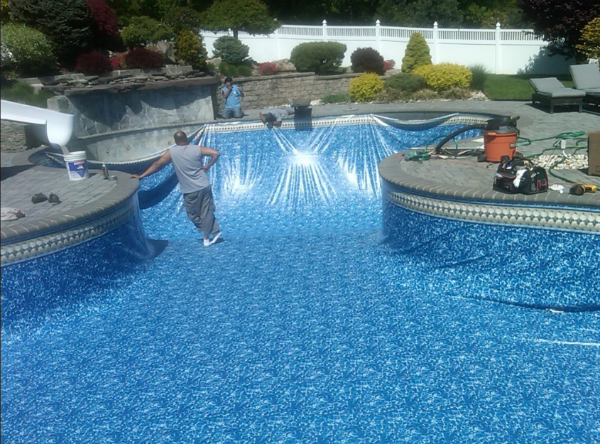 Let Our Experienced Pool Liner Installers and Technicians Help You Today! Has the bead of your pool liner come out of the track? Your pool liner was constructed to fit snug to the shape of your pool. But, if the liner was incorrectly installed or off centered or if it was not constructed perfectly to the shape of your pool, you may find that the bead will come out of its track. It is possible to use blow dryer or a heat gun and a lot of muscle to stretch the liner back and lock it into the track. You must be careful to keep the heat gun or blow dryer close enough to the liner to make it pliable but far enough away to avoid burning a hole through your pool liner. Be very careful though as water and electricity really don’t mix very well… Also, sometimes boiling water can help in the process of stretching your pool liner. In all cases care needs to be taken so as not to tear the liner, melt it, or for that matter burn or electrocute yourself (OUCH!). You can also utilize a liner lock, a thin strip of plastic with ridges, to help ‘lock’ the liner bead into the track by wedging it in with the liner. The best advice would be to consult with a professional for these problems so that you can avoid further damaging your pool liner. Is Your Pool Liner Leaking? This can be a common problem with vinyl pool liners. Generally, Vinyl Pool Liners are manufactured in anywhere from 20-30 mil thickness, above 25 mil thickness usually being offered as an option. While pool liners are resistant to punctures, they can still occur, especially as your pool liner ages and becomes more brittle losing all its resiliency. If you to see a small hole in the liner, you may be able to still patch it with a vinyl liner patch kit. If the puncture is under the water line you can purchase a ‘wet’ patch kit. If you find that you are adding an inch of water or more of water to your pool weekly, taking into account the water lost when backwashing or through splashing out, you may have a leak. You shouldn’t ignore even the more minor leaks as they can cause a washing out of the fill supporting the walls or worse yet the floor which could cause sinkholes to be created. Additionally, you should avoid draining a pool with a vinyl liner or allowing it to leak below the level of the pool walls. The weight of the water within your pool in effect holds your liner tightly into place against the floor and the walls. If you remove enough of the water the liner will have to be reset back into place by using a vacuum while being refilled or large wrinkles could appear while trying to refit a loose fittting liner. ​Also, an empty pool liner could allow rain water in behind the walls which can wash away or destroy the shape of the floor or risk a collapse of the wall and a cave in. 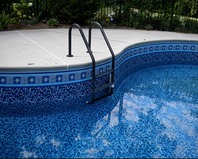 It is always best to seek the assistance of a Pool Liner Professional when delving into these areas. Note: You should always be sure to dilute the chemicals you add to your pool, primarily the pH decreaser and Calcium Hypochlorite / shock. These chemicals can settle to the bottom bleaching your vinyl liner and compromising the strength and resiliency of your pool liner. The work necessary to replace a vinyl pool liner starts with taking measurements of your pool for the new pool liner. After the liner is manufactured and delivered it will usually take a full day to remove your old liner and install the new one (not including the time to drain and refill your pool). Your pool must be drained, then the old liner removed in pieces and those pieces are collected to be recycled. After your old liner is removed we work the pool walls, re-taping joints while also scraping or sanding out any irregularities. If areas of your pool walls are pitted, corroded, or rough we may recommend foaming the walls to prevent damage to a new liner. This will also provide a soft feel. All of the hardware (face plates) surrounding the ports and returns are removed and the tracking will be thoroughly inspected, and if necessary, damaged sections will be replaced. As a final step before "dropping" the new liner and setting with a vacuum we will perform any necessary floor work. If necessary, we will remove contaminated sand and replace it with new sand. The floor is then troweled by hand to eliminate any irregularities and meet design specifications for which the liner was manufactured. All debris are removed and if the floor is vermiculite or concrete it is swept and cleaned thoroughly. Once the pool is prepared, we place the liner across the pool and "lock it" completely into the track located below the deck level. We then position one or more vacuums as we adjust the liner into place, and work out all wrinkles during this process. Next we make the cut for the main drain as well as any existing steps. Finally, we use a hose to begin filling while the vacuums continue to run until we hit the desired water level. We then remove the vacuums and finish locking in the liner where the vacuums were located. When your pool is full, we will then cut-in the wall face plates and install them. Now all you have to do is start up the filter, balance your water chemistry, and you’re good to go​! Is your Pool Liner’s color fading? Over the years the effects of the sun as well as the chemical you use in your pool will cause your swimming pool liner to fade. 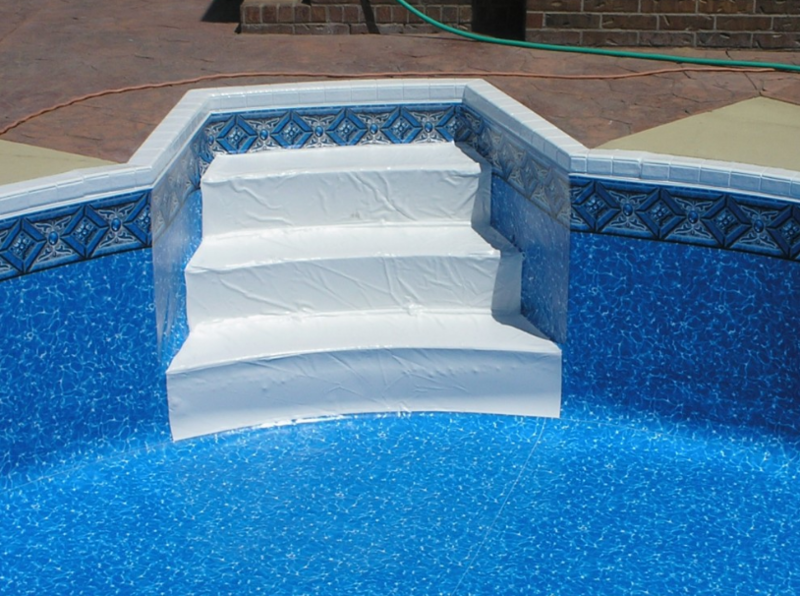 Harsh chemicals as well as high concentrations of chemicals will over time remove the coating (plasticizers) which help pool liners retain their resiliency in turn leading them to become brittle and over time necessitating the need for a new replacement pool liner. The chemical makeup of newer modern pool liner vinyl now let’s vinyl manufacturers create vinyl pool liners which are much more durable as well as resistant to the sun, chemicals, and algae than they have been in the past. Note: In your efforts to get your pool liner back into its track you will sometimes need to lower the water level a foot or more depending on how far out of the track your liner is. It’s better to address your pool liner issues before it gets to this point as they are easier to deal with early on before you have to lower the water. Just pick up the phone right now and call us, that's all! 757-367-8908 We'll be more than happy to help you! If it is after hours or you just happen to be feeling a bit shy just fill out our contact form and we'll get back to you in a jiffy!